In February of 2011 an earthquake event caused significant damage and loss of life in Christchurch, New Zealand. Such an event serves as motivation for improved foundation design and characterization of the shallow subsurface. In January of 2013, University of Texas engineers acquired surface wave data which has been made available to the ASCE GeoInstitute Geophysical Engineering Committee for a benchmark project. Participants were invited to process and interpret the common data set. 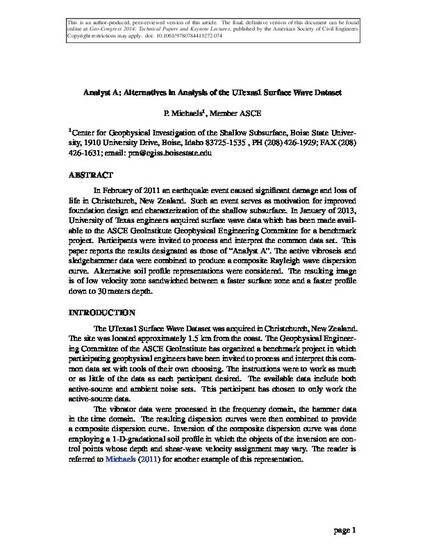 This paper reports the results designated as those of "Analyst A". The active vibroseis and sledgehammer data were combined to produce a composite Rayleigh wave dispersion curve. Alternative soil profile representations were considered. The resulting image is of low velocity zone sandwiched between a faster surface zone and a faster profile down to 30 meters depth.